No worries, Simon. I think you’ll like this one! Brilliant review. I really love this book, although I have only read it once, so you’re definitely making me want to re-read it. Such wonderful characterisation and Taylor perfectly captures the mood of the people in a small seaside town, bored, lonely gossipy etc. Yes, that’s exactly why the Penelope Fitzgerald comes to mind as the settings feel quite similar. There’s a lot of people-watching going on here – Beth catching her father with Tory, Mrs Bracey watching the various goings-on from her upstairs window. Even Bertram is an observer of sorts, albeit a somewhat deluded one. What a wonderful canvas for Taylor to explore! I absolutely loved this book. Mrs Bracey is one of the truly great literary monsters. I’m so glad to hear that you loved this too. And yes, what a wonderful creation in Mrs Bracey. Taylor seems to have a real knack when it comes capturing these bawdy, gossipy women – frequently charladies or landladies. ‘I hear Mrs Foyle’s getting herself talked about again,’ Mrs Bracey went on, turning to the curate. Mr Lidiard stiffened. He would have spoken up for Tory, but he realised it was useless. With Mrs Bracey there was nothing to do but wait for her to die, which she would probably do long after her time. ‘Did he go inside with her afterwards?’ she asked Mrs Flitcroft. ‘I couldn’t say, I’m sure.’ Mrs Flitcroft said, very off-hand, for the curate’s benefit, but nodding behind his back. Lovely review – and one of my favourite Taylor novels. As you say, she’s so good at a paragraph that takes through the town – the bit you quote for that is wonderful. Thank you. I had a feeling it was one of your favourites – that’s great to hear. I adore those passages where she roves around the town, offering little glimpses of the characters’ lives as she goes. There’s something terribly tragic about that image of Mrs Bracey lying in bed as she awaits her daughter’s return. Maybe it’s the little detail about her hands plucking away at the bed cover, almost in desperation as well as annoyance. It sounds simply excellent. But then, Elizabeth Taylor! Well, yes – she certainly sets a very high bar. The only Taylor I didn’t particularly enjoy was Angel, which I read earlier this year – rubbish timing on my part, no doubt. That said, I found it less sympathetic than her others, crueller perhaps, certainly in its portrayal of the central character Angel Deverell. It’s still a good book – just a bit different from the others I’ve read by her, and maybe not for me. Going back to the Harbour for a mo, I think you’d really like it, especially given your fondness for Penelope Fitzgerald’s Bookshop. It’s up there with the rest of my favourites. Excellent review as always Jacqui. 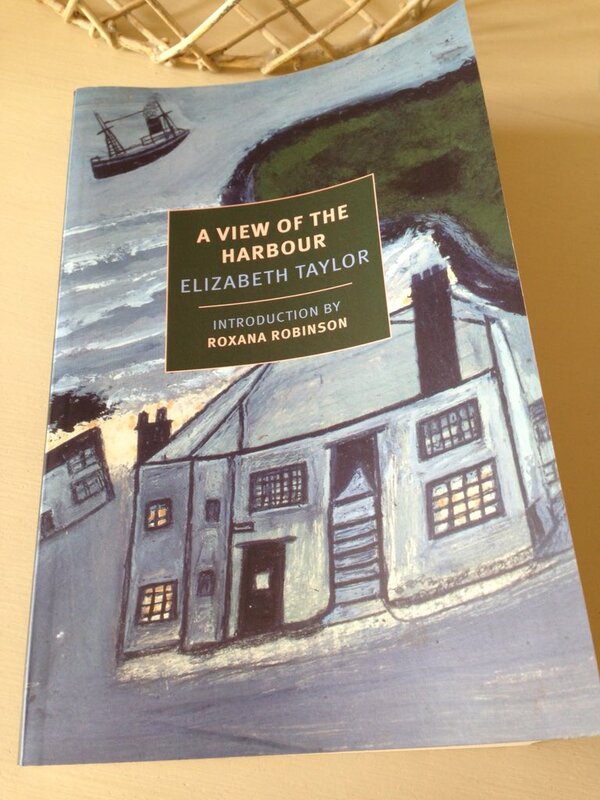 This is such a good book, one of my favourite Taylors, though I read it pre-blog during a year long read of her books. She’s so good on character and so subtle at times – and yes, there is a darkness always lurking in her stories. Thanks, Karen. I’m sure it would stand up to a re-read if you ever fancy a return to Taylorsville! Yes, there’s always an edge to her writing, a bit of shade alongside the light. I found it rather melancholic in parts too (in a good way, if that makes sense). Those little pen portraits of Lily Wilson were so poignant, especially the scenes between her and Bertram. I couldn’t help but feel for her in the end. At the risk of soundind very superficial, and though this has been on my wishlist forever, I’m waiting in case Virago also released this one with a special cover, like the ones they did for A Game of Hide and Seek, or A Wreath of Roses, and especially for Angel, with its superb blue peacock ! Not superficial at all – they’re beautiful editions! I had already bought the NYRB by the time the new Viragos started to appear last year, otherwise I might have been tempted to hang on myself. Mind you, I am very partial to these NYRB editions, and this particular example is one of the prettiest – the cover image seems to capture the town so perfectly. Thank you for introducing me to this author. I’m sure I will enjoy this and other of her books. You’re very welcome. I do hope you enjoy her – she’s one of my favourite writers. I really need to finally read Elizabeth Taylor! I’ve only heard wonderful things. Thanks for sharing your review, Jacqui! Oh, yes – please do give her a try, Jessie. She’s all kinds of wonderful. This would be a good one to start with as it came fairly early in her career. Plus, I think it would give you a great indication of her style. Enjoy. I’ve read a few Taylors and really enjoyed this one. It’s great isn’t it? So perfectly observed. You really get the feel of the dynamics of small-town life. I’m reading this right now, slowly, as I haven’t had much reading time this week and am savoring every word. I’m interested in your comments about Penelope Fitzgerald’s The Bookshop and do see a parallel. I’m reading a Virago edition with an afterword by Robbert Liddell. I really enjoyed your review. Wonderful. I’m delighted to hear that you’re enjoying it too. And yes, it’s certainly a novel to savour – one of her best, I think. The setting is beautifully evoked here, complete with all the secrets, deceptions and observations of small-town life. I think that’s why The Bookshop came to mind as I was reading it. Both of these writers (Taylor and Fitzgerald) are adept at capturing a feeling of loneliness in their work. There’s a sense of emptiness in some of these individuals’ lives which feels very true to life. I just finished it and wasn’t expecting the surprise at the very end, the appearance of Tory’s husband. Fabulous! This novel will make my favorite books of the year list. I really liked the ending of this one – it just felt so ‘right’ for all parties involved! I’m so glad you enjoyed it – definitely a reading highlight for me too. Excellent review. It makes me think it must be time to reread this. To relish all over again the specific pleasures of this account of the harbour community. Thanks, Caroline. I’m sure it would stand up to another reading. Taylor’s portrait of this small-town community is so richly observed that you’re bound to get even more out of it second time around. Lovely. Yes, I completely agree with you on the atmosphere in the town. There’s a definite post-war feel to the place, particularly in the pub, cafe and waxworks museum. The fact that Iris is waiting for something exciting to happen only emphasises that underlying sense of neglect and dreariness. I really enjoyed revisiting this wonderful novel through your review. It perfectly captures the oppressive noseyness of a small village. That’s nice to hear, Sarah. I’m glad you enjoyed this too. It seems to have been a hit with several readers. Ha! Thanks, Madame Bibi. I think you’re going to love this one. It’s actually quite affecting in a somewhat melancholy way. Amidst the moments of dark humour, you get a sense of these disparate souls drifting around the harbour town, intersecting with one another but very rarely connecting. It’s a great novel, one of my favourites this year. Oh this sounds like another one to look forward to. That last quote is so wonderful. I’ll get to this sooner or later for now I still have The Soul of Kindness and In a Summer Season. Yes, indeed. There’s a lot to look forward to here, not least the little sections where Taylor takes a helicopter view of the town, alighting on various characters in turn. She does this a few times over the course of the story, and the passages in question really stand out. It’s a truly lovely book – I’m sure you’ll enjoy it whenever you get the chance. Terrific commentary, Jacqui. This was among the first books I read this year and will certainly go on my highlights of the year list. I love how Taylor interweaves Beth’s writing and Bertram’s painting into her portrait of small town life, such that the novel develops like a novel being written and a painting being painted. And the book is so funny too – another aspect to recommend it. I’ve puzzled over the connection of A View of the Harbour with Virginia Woolf’s To the Lighthouse, which serves as an obvious reference to the point where Taylor’s novel almost seems a kind of dialogue with or even riposte to Woolf’s. But I can’t quite make out what Taylor thinks of Woolf; she certainly seems to bring her back to earth a bit, to the quotidian intrigues of village life rather than the lofty meditations on time and art. Betram doesn’t lay down his brush in “extreme fatigue” at the end, having had his vision like Lily Briscoe; he just finishes his little portrait and hangs it in the pub. And of course Angel is also a fictional engagement with the business of writing, so it fits that Taylor is doing this again here. Thanks, Scott. I’m so glad you enjoyed this novel too. I think it’s one of my favourite Taylors – certainly up there with Mrs Palfrey at the Claremont, my introduction to her work. That’s a terrific point about the way Taylor touches on Beth’s writing and Betram’s painting at various points in the book. And I love the way you’ve expressed this in your comments – what a wonderful way of looking at it! I really warmed to Beth as a character in spite of her rather scatterbrain approach. Deep down you get the feeling that she cares about her family – she just has a funny way of showing it. Betram is a bit of an oddball too — but then again, he’s the only one who tries to reach out to Prudence in an effort to connect with her in some way. Perhaps Bertram sees something of himself in her, another lonely or misunderstood soul lacking a bit of direction in life. I’m really interested in your points about a possible connection between Harbour and Virginia Woolf’s To the Lighthouse, too. That said, I’m struggling to comment any further due to a lack of any real understanding of that book. (For personal reasons, it’s been quite a while since I read any Woolf, and I can’t see that changing in the near future – sorry!) I’m kind of hoping Grant will drop by at some point as he read To the Lighthouse not so long ago. He’s also read a lot of Taylor, this one included. I hadn’t thought about any links between Harbour and Angel, but now you’ve highlighted the interest in the writing process I can see the connection. Have you read Palladian, another of Taylor’s early novels? It’s a sort of riff on Jane Austin’s territory – some of the themes are pretty similar. Maybe that’s another indication of Taylor’s interest in the business of writing, a sort of homage to one of the literary giants?